Meet David Mikhallovitch Iakobachvilli from Georgia, resident in Monaco since 2004. "Corruption and embezzlement from public funds." Born March 2nd, 1957 in Tblissi, with Swedish nationality, Iakobachvili linked, since the 1990s, to Baumanskaya, a branch of the Solntsevo organized crime group. In 1995, Iakobachvili was questioned in France on behalf of the Kazakhstan Republic in a case of corruption and embezzlement of public funds through a company in Nice called Mediterranean Trade Invest, set up in Valbonne in 1990. Iakobachvili had been in a partner in two Russian companies--Cherri Casino and Trinity Motors--linked to organized crime figures; his partner at Trinity Motors, Vladislas Vigorbin, was murdered in 1995 in Moscow by the Red Mafia. Vigorbin had been an active member in the Baumanskaya organized crime group, which specialized in cocaine traffic and money laundering. 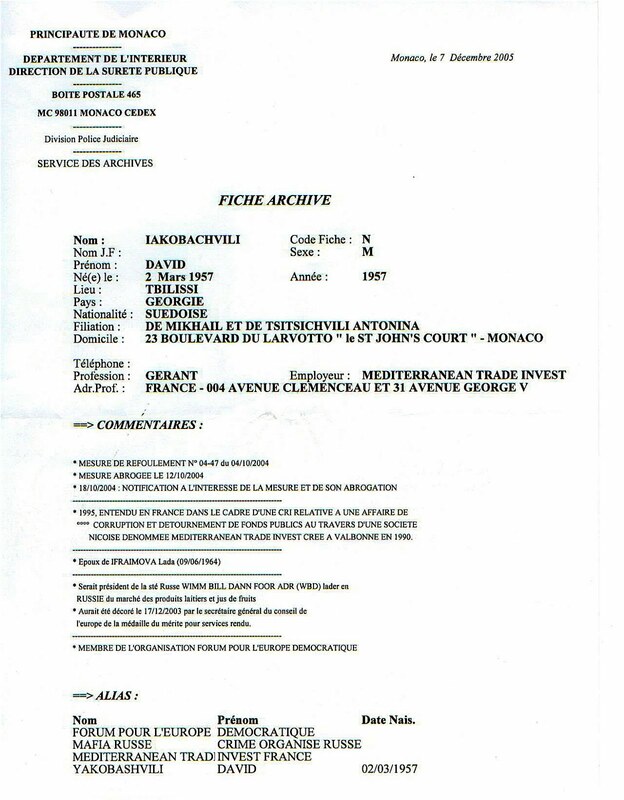 Furthermore, intelligence collection suggested Iacobachvili had deposited money into an investment fund in Geneva called Ficogex SA, which then passed money to a Geneva company--Atrax Properties Ltd--allegedly owned by Stephane Valeri, a prominent Monegasque politician, in the name of Maurice Christie, a Swiss nominee and the company's manager. Hence, it looked as though Valerie had received money from Iakobachvili to support his presence in Monaco. Iakobachvili had wanted a bank account in Monaco, but was blocked until Valeri interceded on his behalf and got HSBC chairman Gerard Cohen to personally approve an account.